New Features: language switching, advanced Office 2016 support, new PDF engine, further improved performance! The core functions of Perfect PDF® Converter, for example the PDF creation from within all programs that have a print functionality, the integration in common Microsoft applications and the conversion between PDF and XPS are still available - but much more powerful than ever. The program offers the integration into Windows Explorer, Microsoft Office (Word, Excel, PowerPoint, Outlook, Visio und Project) and OpenOffice.org (Writer, Calc, Impress, Draw, Base, Math). It is possible to create a PDF file out of these applications with just one click. 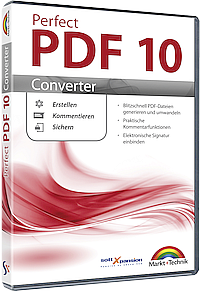 Perfect PDF® Converter allows timesaving PDF creation, in the office or at home, and is the right program for PDF beginners. Further functions are printing and signing of PDF files, features to rearrange the document structure (move, remove, resize and rotate pages) and to annotate PDF documents using text notes, markup or pen. You can also create PDF documents from text or image files and insert pages from image files or scanned images. A viewer for PDF or XPS files is also included. The integration of common Windows applications and its additional tools for managing your electronic documents make this software much more than just a PDF or printing program. New version of PDF editor for powerful processing of PDF documents. PDF and XPS: create, convert, edit, design and annotate. 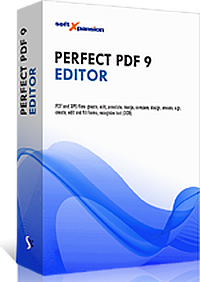 Perfect PDF® Editor is a product with which you can create, edit and manage PDFs and other electronic documents for home and small- to mid-sized business users. Edit existing PDF documents and annotate them, design documents, create complex forms and sign PDFs. With the powerful, user-friendly page editor, you can edit all of a given page’s content, not just the text and images. In addition, you can create completely new documents. The core functions of Perfect PDF® Premium, for example the PDF creation in each program with print functionality, the integration into common Microsoft applications and editing of existing PDF documents are still available - but much more powerful than ever. The program offers the integration into Windows Explorer, Microsoft Office (Word, Excel, PowerPoint, Outlook, Visio und Project), and OpenOffice.org (Writer, Calc, Impress, Draw, Base, Math). It is possible to create a PDF file from within these applications with only one click. The language switching permits to select from four languages (German, English, French and Italian). Perfect PDF® Premium allows timesaving PDF creation, in the office or at home, and is a good solution for PDF beginners and for professional users alike. Further functions are the creation, editing and management of PDF files and other electronic documents for home and small- to mid-size business users. Furthermore, it is possible to edit existing PDF documents and annotate them, merge, design documents, create complex forms, sign PDFs, recognize text in scanned images with OCR and make use of various special PDF features and properties. A viewer for PDF or XPS files is also included. The Integration into common Windows applications and additional tools for managing your electronic documents make this solution much more than just a PDF or printing program. The product suite for working with PDF documents with new features: language switching, advanced Office 2016 support, new PDF engine, further improved performance! The core functions of the all-in-one application Perfect PDF® & Print, for example the PDF creation in each program with print functionality, the integration into common Microsoft applications and editing of existing PDF documents are still available - but much more powerful than ever. Annotate your PDFs, design document layouts, create complex forms, sign PDFs and make use of various PDF features and properties. The language switching permits to select from four languages (German, English, French and Italian). 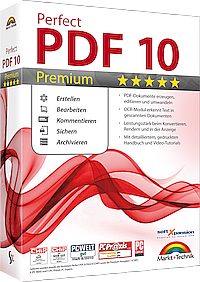 Perfect PDF® & Print allows timesaving PDF creation, in the office or at home, and is a good solution for PDF beginners and for professional users alike. Further functions are the creation, editing and management of PDF files and other electronic documents. Furthermore, it is possible to edit existing PDF documents, annotate them, merge, design documents, create complex forms, sign, recognize text in scanned images with OCR and make use of various special PDF features and properties. Perfect Print helps you control your print output and allows many options to arrange your documents. The Integration into common Windows applications and additional tools for managing your electronic documents make this solution much more than just a PDF or printing program. 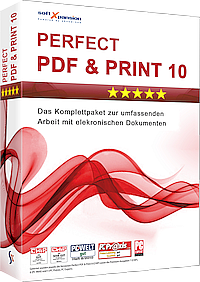 Perfect PDF® & Print consists of Perfect PDF 10 Premium and Perfect Print.